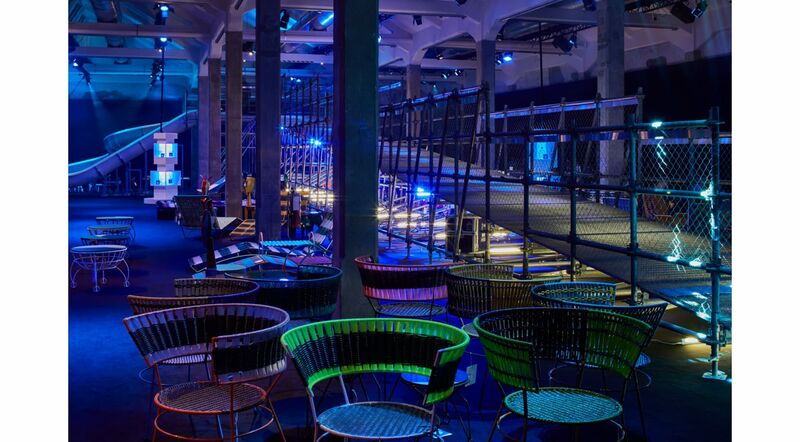 On occasion of Salone del Mobile 2019, Marni stops off on the Moon to explore infinite worlds. 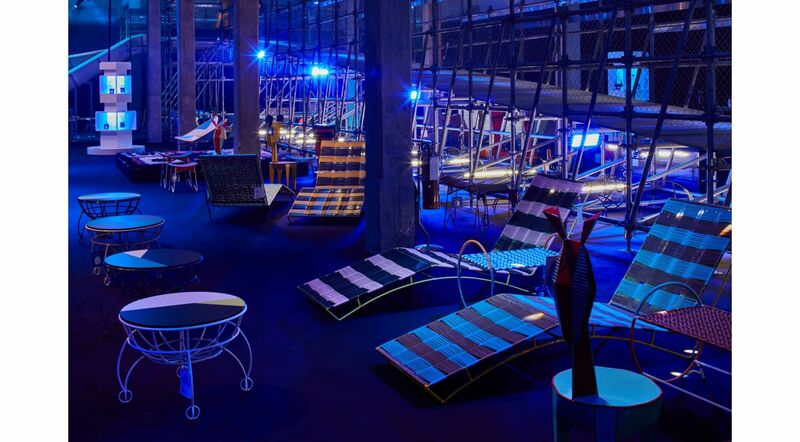 Marni pays tribute to this universe by presenting Marni Moon Walk: a space in which primitive allure blends seamlessly with imagination of the future. 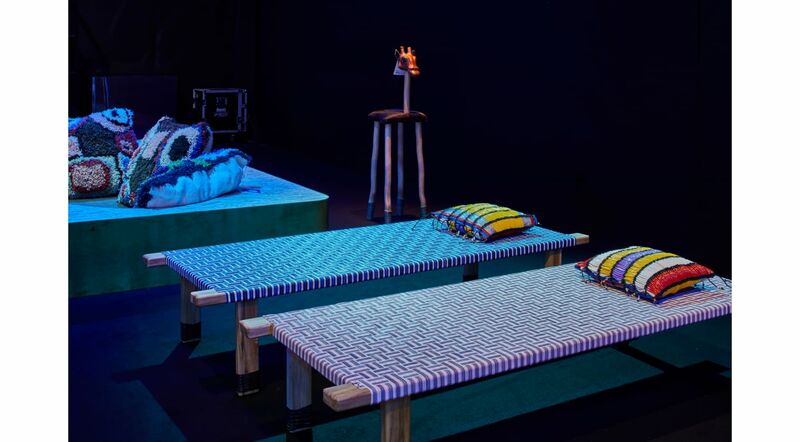 The set-up envisions a sensory journey of discovery for visitors to the creative universe of Marni. 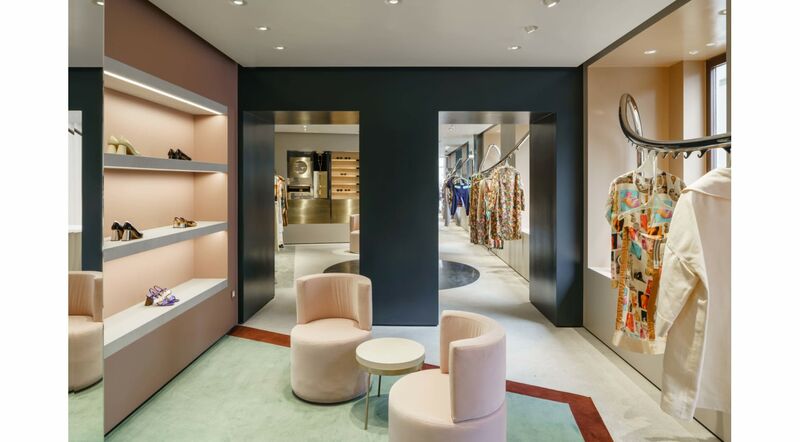 A path populated by furnishing accessories and designer objects, where the unpredictability of the brand's visual language is palpable in every single detail. With this project, Marni presents a series of original products created using unexplored materials. Each product is the result of the work of a community of Colombian artisans which have been working with Marni for many years. Visitors at the Marni venue in Viale Umbria 42 will have the chance to discover a collection of products that creatively adapt to any space, like the fun series of round formica clad wooden and metal coffee tables which evoke the shape of spaceships. 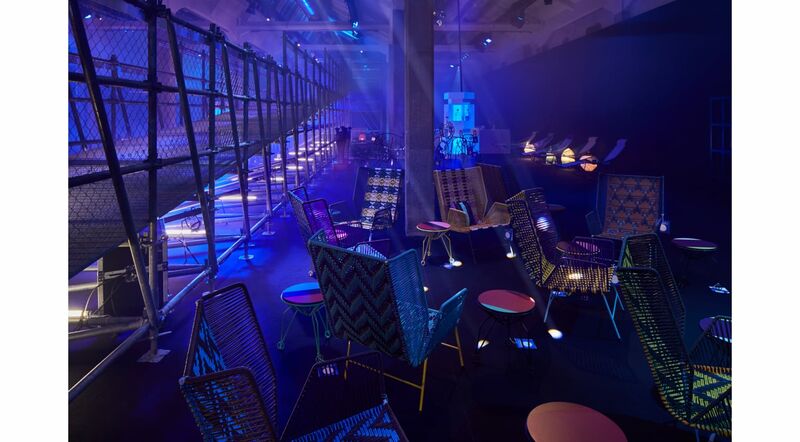 The path also features designer objects which can be exhibited as furnishings, such as tribal aliens, spaceship-shaped sculptures, sculptural coffee tables and stools in the shape of animals, made from metal sheet and hand painted. Together with these products, the space hosts a series of primitive benches and stools in wood and leather that evoke tribal totems. 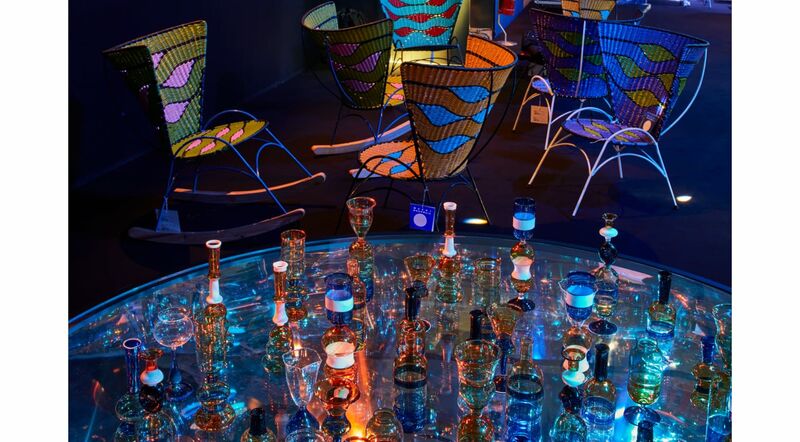 The area is also populated by cushions, colourful wool and natural fibre rugs, along with a special collection of glasses and blown glass bottles celebrating colour. This edition also sees the presentation of colour PVC and metal accessories, but in the form of new creations, like petite sofas, rocking chairs and an extensive selection of chaise longues which invite us to dream. 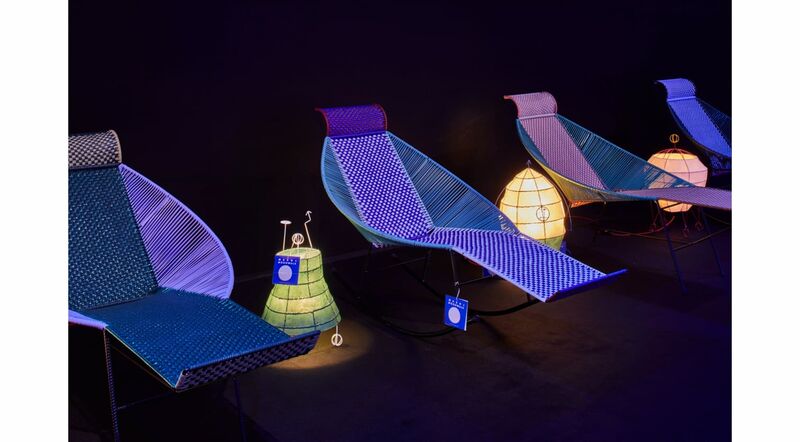 Seating cushions feature original patterns and sculptural lamps evoke spaceships. This year the Marni Salone del Mobile project supports an initiative of OTB Foundation: part of the profits from product sales will be donated to the “Future Brain” project (www.progettoheal.com) promoted by Associazione Heal, a socially useful NPO, to support child patients at the neuro-oncological ward of the children's hospital Ospedale Pediatrico Bambino Gesù in Rome. 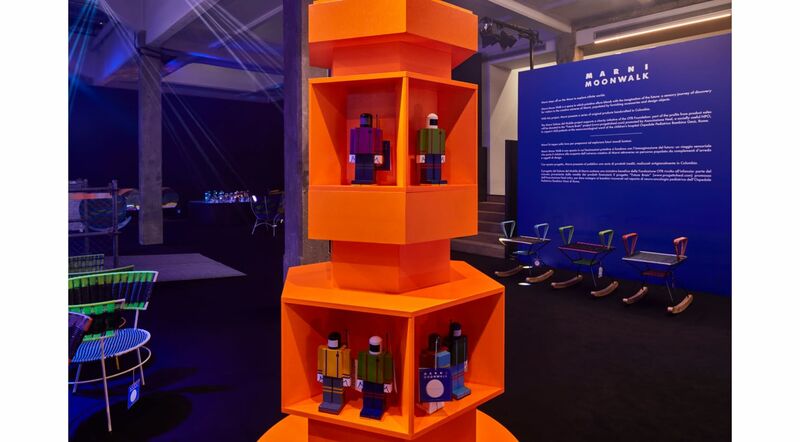 For the first time ever, a large selection of Marni Salone items will be on sale at one of Marni’s key partners, Luisa Via Roma, which will start to sell on line in pre-order in April, the week after Salone del Mobile and then from June during Pitti Immagine Uomo, both in their www.luisaviaroma.com and on their store terrace, entirely occupied by Marni Salone. 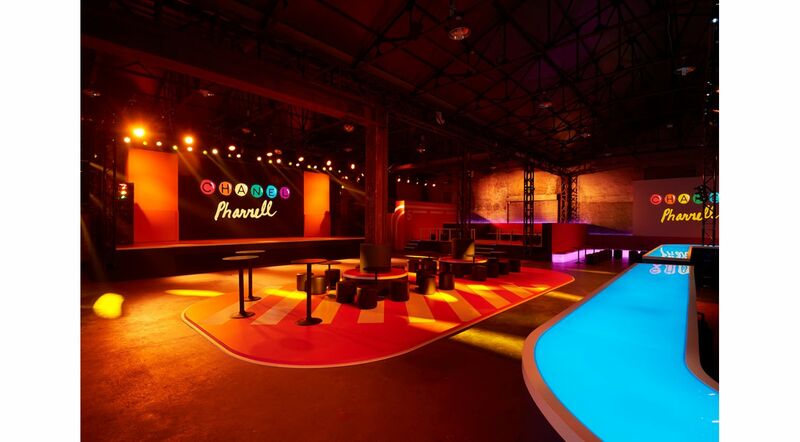 Marni Moon Walk will open to the public from 11th to 14th April 2019. 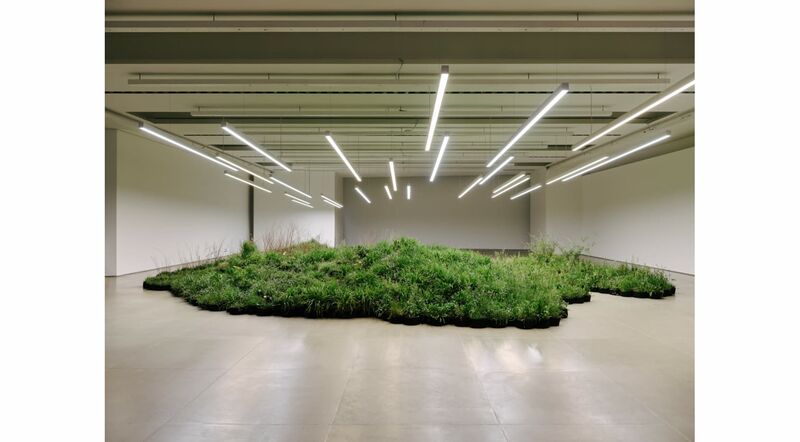 A large living installation of spontaneous plants picked from abandoned sites in the area of Milan. 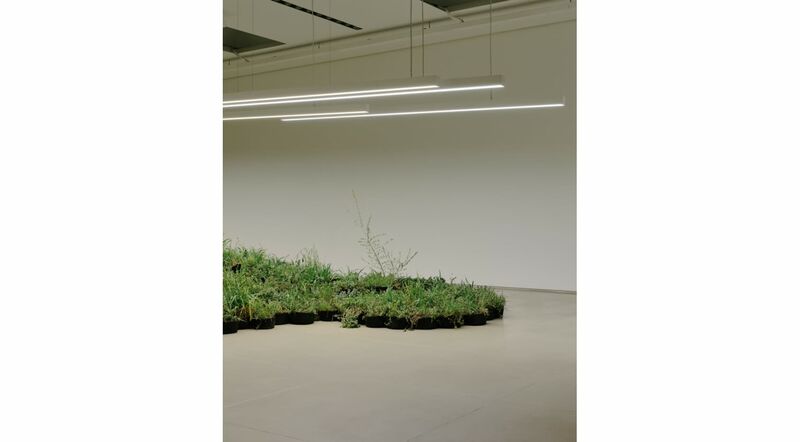 This is the stem of what artist Linda Tegg has conceived with Lucie and Luke Meier for the spaces of Jil Sander’s head- quarters, on the occasion of Milan Design Week 2019 and to introduce the first in a new series of Jil Sander+ collections. Durable products, for both women and men, made for life outside of the city : time spent in the mountains, by the sea, in the countryside. 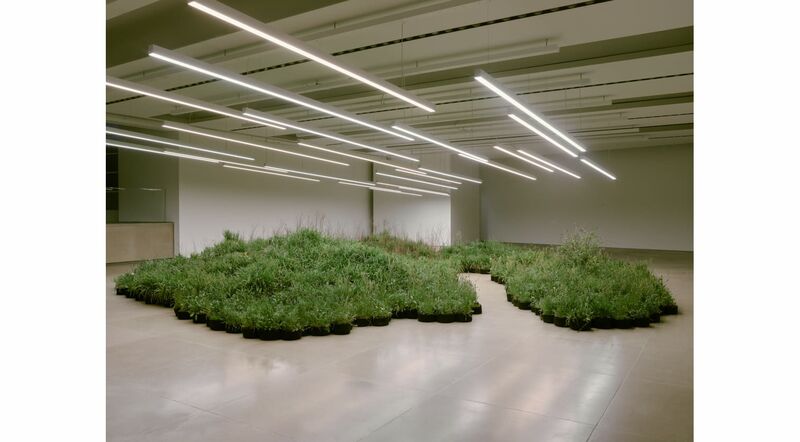 After the exhibition, some of the plants will be returned to their original environment, while others will be refor- med into a permanent assemblage, evocative of the spontaneous and overlooked urban flora of Milan. 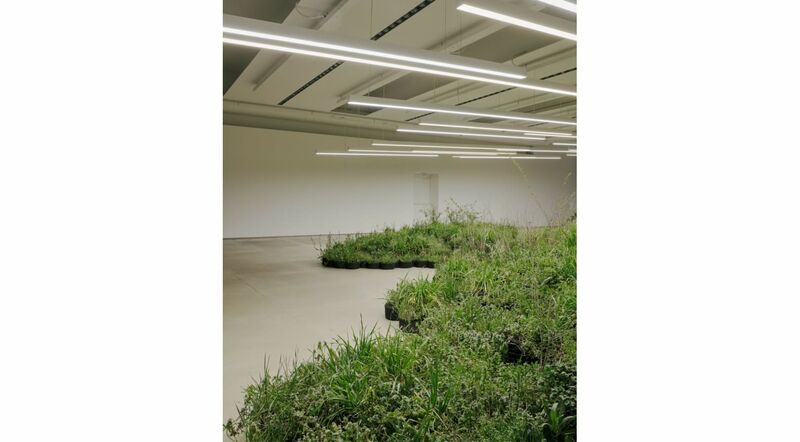 To be constantly nurtured as a living being within the Jil Sander studios. Turning the everyday into a space which is dedicated to the exceptional. Attention to looking, contrasts, awareness and care. “The plants will stay with us. Environmental issues seem, and need to be, more and more well rooted, rather than a trend”, say Lucie and Luke Meier. “We need to be ready to behave in different ways, even uncomfortable and inconvenient, to make a change. We need to find a way to coexist well with nature. The permanent installation of spontaneous plants will be a constant reminder, a catalyst for our awareness”. “Spontaneous plants break through the fabric of the city, they assert themselves against a logic that seals away access to soil, light, and water – a chance at life. The Field Photographs celebrate these acts of resistance, once you start noticing, you can find them everywhere”, Linda Tegg says. “These plants are neither singular, spectacular, or of any monetary value. They exist alongside us often on the peripheries of our perception. What happens when these beings are brought to the centre of our lives, when we take them into our care ?”. 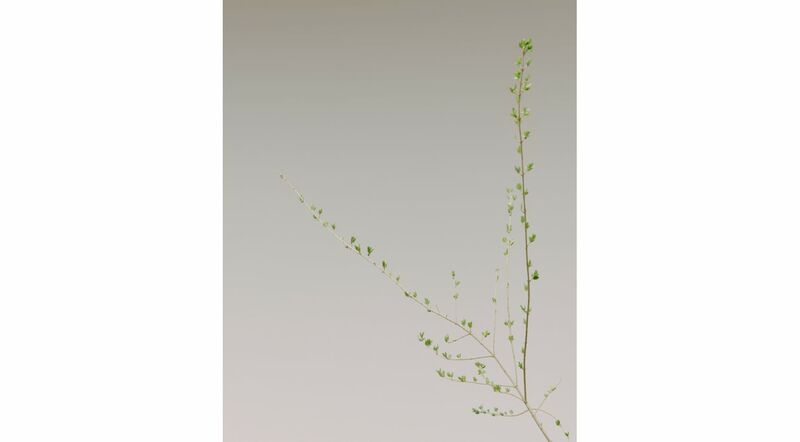 Complementing this first instalment of Adjacent Field, a precious, large-format book, with a broader selection of the Field Photographs by Fox, documenting the sites from which the plants have been sourced, will be on display in the hall of the Jil Sander Studio adjacent to the plants’ installation. As a rare specimen in a botanical library. Effectively linking the sites through photography. pink, black or mirror lenses play with summer light. “Bohemian Vuittony mask” adopts a sportier look with its curved mask design, surrounded by a fine metal bar. Also embracing the chiselled outline of a Monogram flower, this truly futuristic model comes in an acid pink and more classic black. A timeless fashion statement, the oversized square shape adopts a more modern high bridge. Fine Louis Vuitton studs accent the frame, adding a discreet new signature. Stamped with the LV circle, the lenses come in black, green or a mirror finish, respectively teamed with black acetate, tortoiseshell or translucent blue and tortoiseshell. For a fresh view of summer, the collection will be available in Louis Vuitton stores from 31st May. 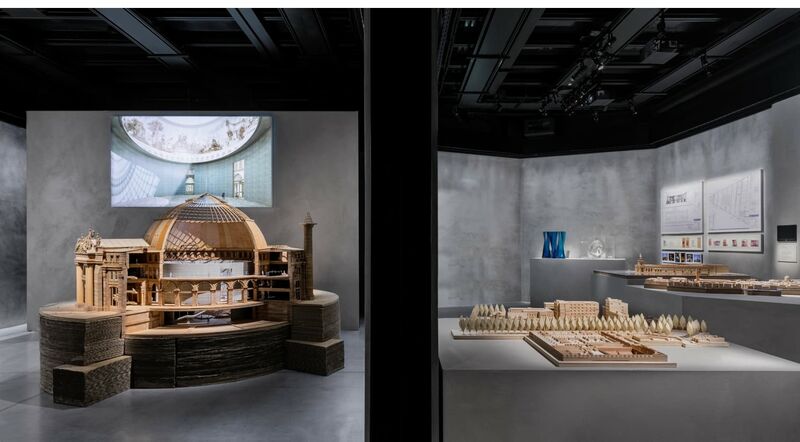 For this year’s Salone del Mobile, a sophisticated design exhibition and a time for cultural reflection, Giorgio Armani will host - at Armani/Silos - the first exhibition dedicated to architecture, a redesigned version of the major retrospective that Centre Pompidou dedicated to Tadao Ando last year in Paris. An original use of nature and the combination of elements like water and light in designed spaces express the Japanese architect’s pure and essential vision. 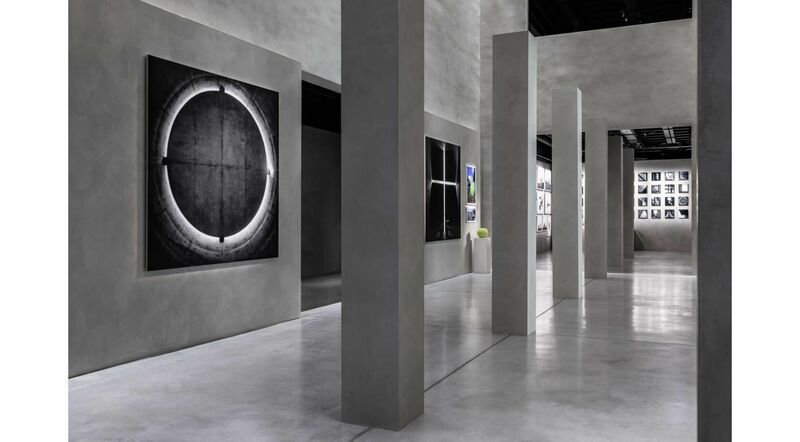 The deep sensibility of the Japanese architect, his philosophy and extreme precision inspired Giorgio Armani to commission him to design Armani/Teatro in via Bergognone, in Milan, in 2001. 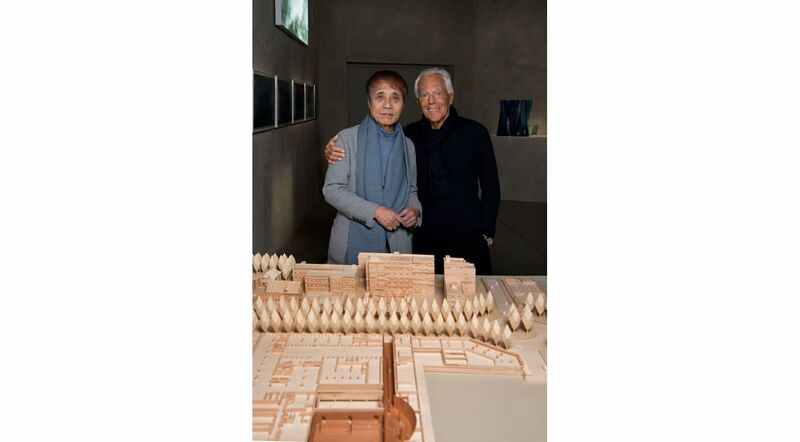 ‘In Tadao Ando’s architecture, I see an extraordinary ability to transform “heavy” materials such as metal and concrete into something truly exciting. I very much like his use of light, a fundamental element that helps shape the character of spaces,’ explains the designer. The Challenge showcases the career of Tadao Ando through his most significant works, from Row House in Sumiyoshi - Azuma House (1976), to Project in Naoshima (1988 to today) and La Bourse de Commerce in Paris (2019). Additionally, for the first time, Ando’s plan for Armani/Teatro (2001) will be on display. The narrative journey through the exhibition - designed by Tadao Ando in collaboration with Centre Pompidou - is structured around four major themes: Primitive Shapes of Space, An Urban Challenge, Landscape Genesis, Dialogues with History. The retrospective includes over 50 projects, illustrated with sketches, original models, video installations, technical drawings, travel notes and photographs taken by Ando himself. 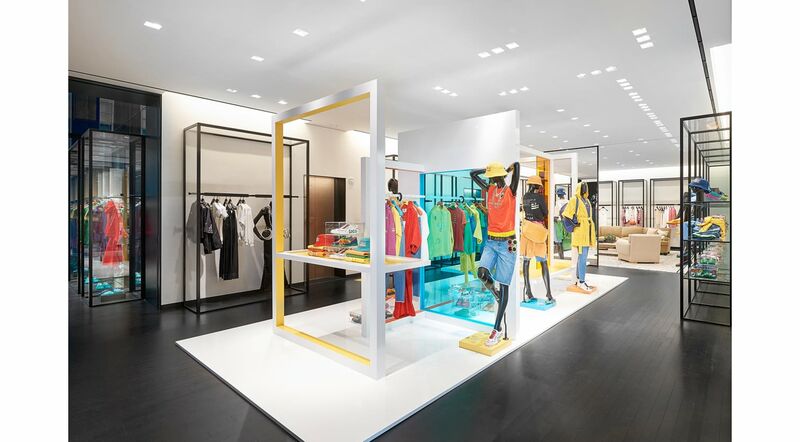 Marni reinforces its presence in Germany with the opening of its first flagship store in the Bavarian Capital. 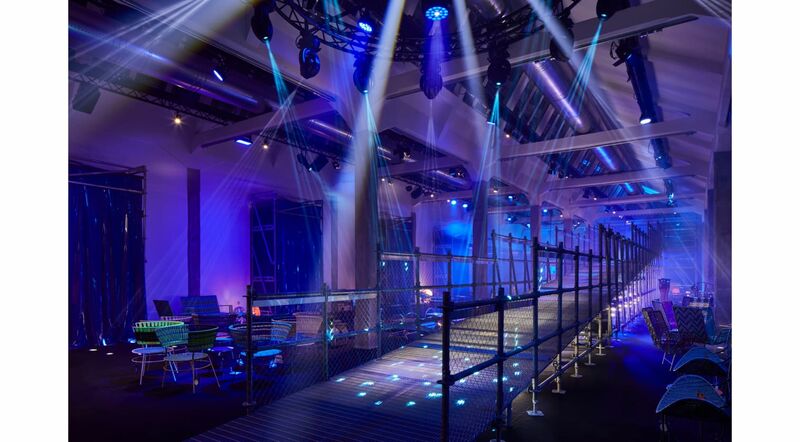 Located inside a historic building on the prestigious Maximilianstraße, the space spans over 160 square metres and houses men's and women's collections. 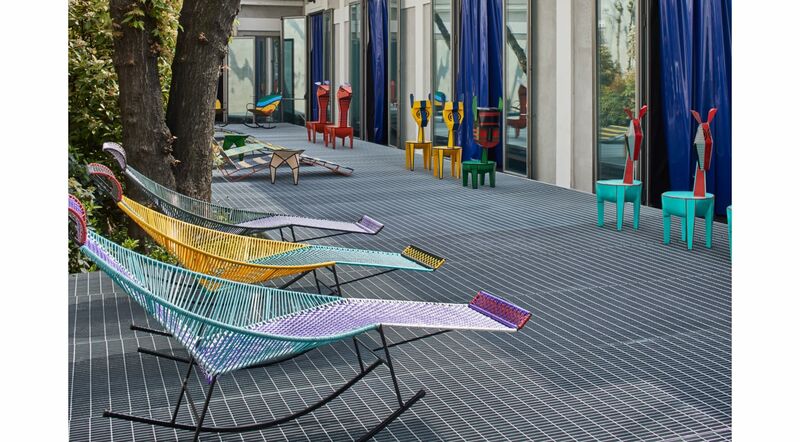 By combining typical elements of the brand's design with details celebrating the hosting city's artistic peculiarities, the premises exude Marni aesthetics and pays homage to Bauhaus with geometric patterns which characterise flooring and some furnishing elements—accompanying visitors along the entire path. 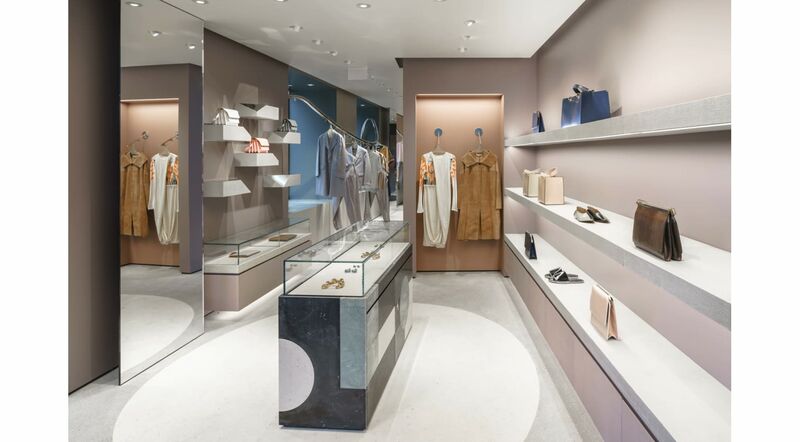 The entrance is characterised by walls in a sophisticated lilac tonality and hosts the women's bag and small leather goods collections, respectively displayed on cement shelves and inside glass cases. The room also features a wall-mounted exhibitor dedicated to ready-to-wear items, and a colourful marble and glass table for accessories. A large Barrisol triumphs in the centre of the room, illuminating the interior and creating a circle shape on the ceiling. 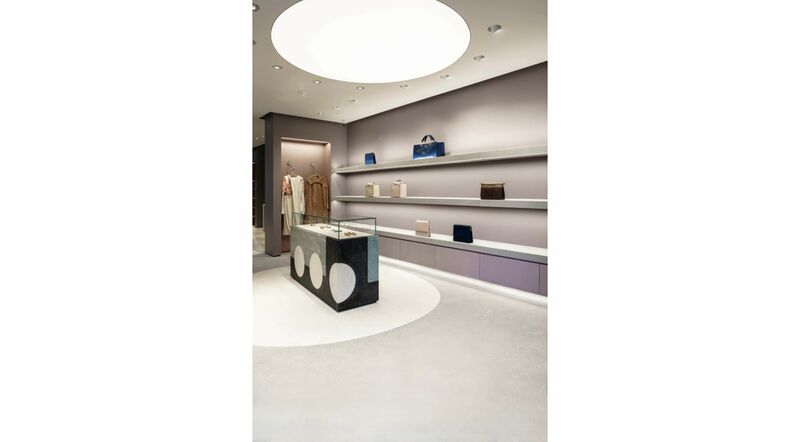 The area dedicated to men's collections showcases footwear and bag collections in flush wall-mounted furnishings. 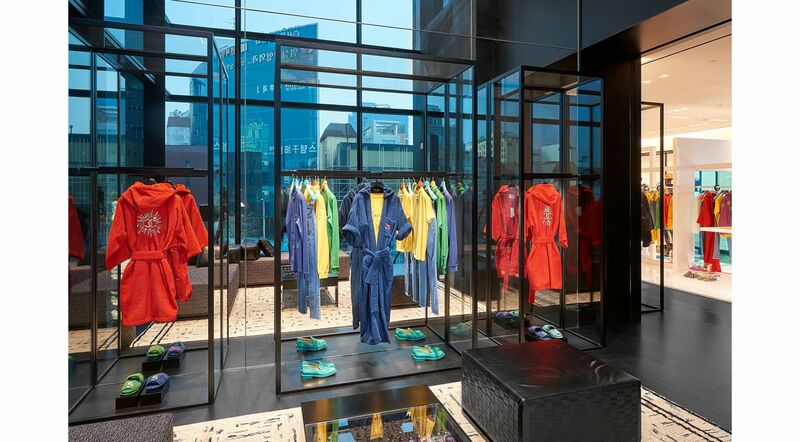 In this room, iconic Marni steel rails used to display ready-to-wear items are anchored to the windows, generating an original dynamic play of waves which is replicated in successive rooms. The area hosting ready-to-wear collections for women is completed by a section dedicated to jewellery and glasses, with items on display in brass and polished steel exhibitors. 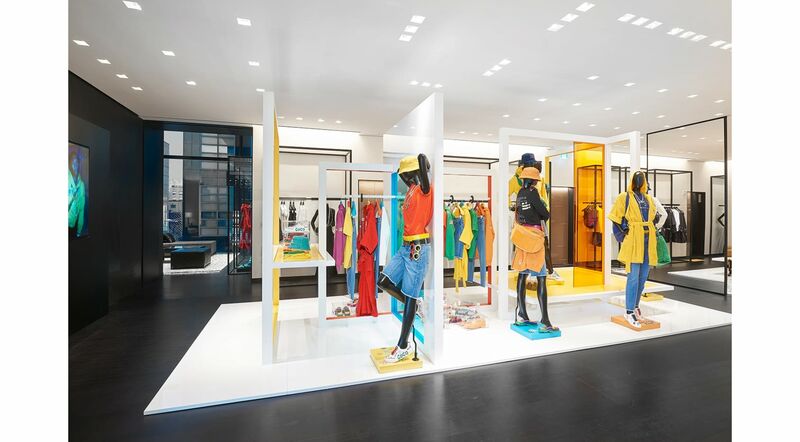 The last room showcases shoes, accessories and ready-to-wear items for women. The area is characterised by a large carpet rug set in green and burgundy flooring. 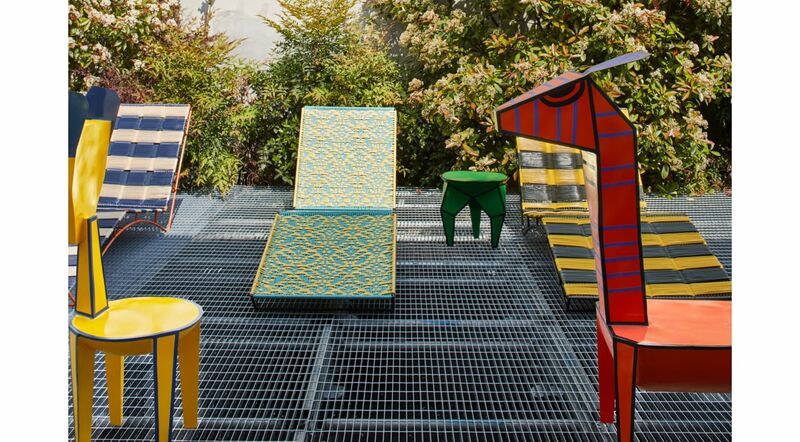 Just like its recent 2018 boutique inaugurations in Florence, Rome, Paris and New York, Marni continues its collaboration with the art universe, celebrating the opening of its Munich flagship store with a video by the artist Cooper Ronan. For Spring/Summer 2019, Acne Studios launches their third special edition of screen printed t-shirts. Featuring images from the personal collection of surf star and artist Robin Kegel, the prints capture the geometric patterns, colours and abstract forms he’s become known for, as well as modern surfing culture. 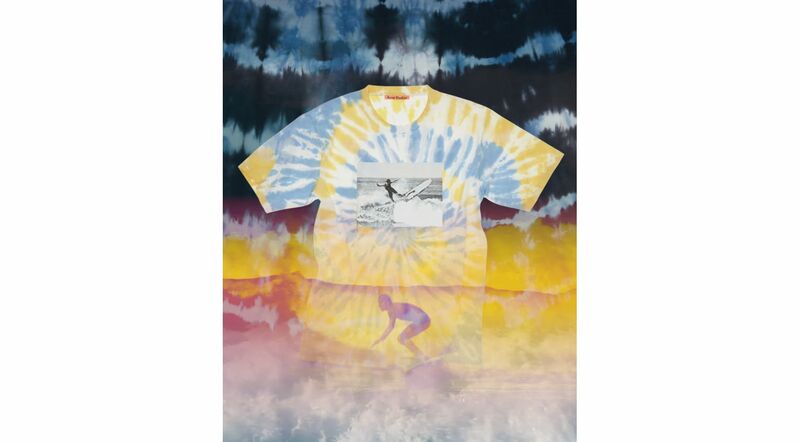 The unisex t-shirts will be available in four unique print and colour combinations: a large image of Kegel painting a surfboard on a white t-shirt, Kegel hitting the waves on a yellow and blue tie dye t-shirt, a photo of artwork panels on a petrol blue and navy tie dye t-shirt, and two images of surfboards juxtaposed on a red and pink tie dye t-shirt. 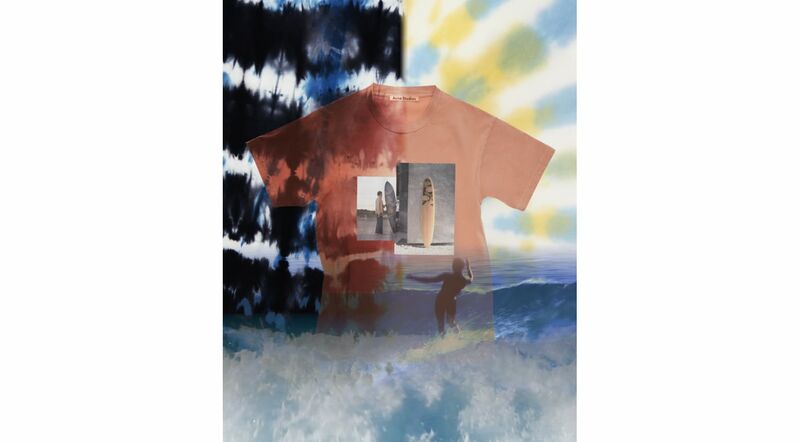 “The featured images on the t-shirts document the abstractions and signature geometric prints I created for Acne Studios, showcasing the surfboard factory during that time. 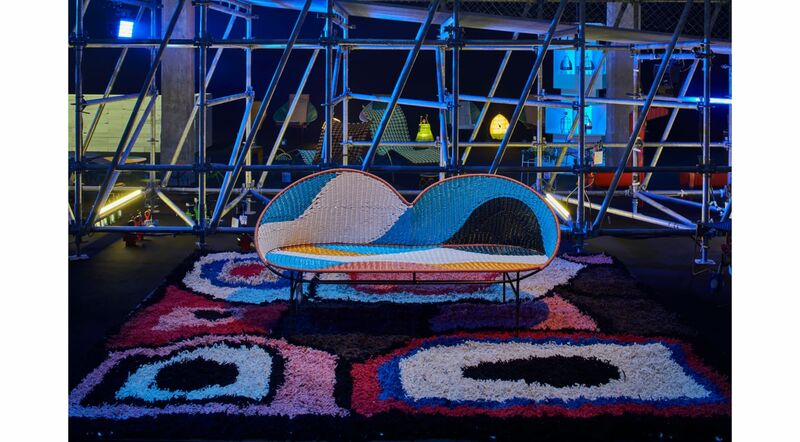 They convey the experience the psychedelic dyes and factory, explore the infatuation and represent the collaboration’s raw form and organic industrial projection,” says Robin Kegel. 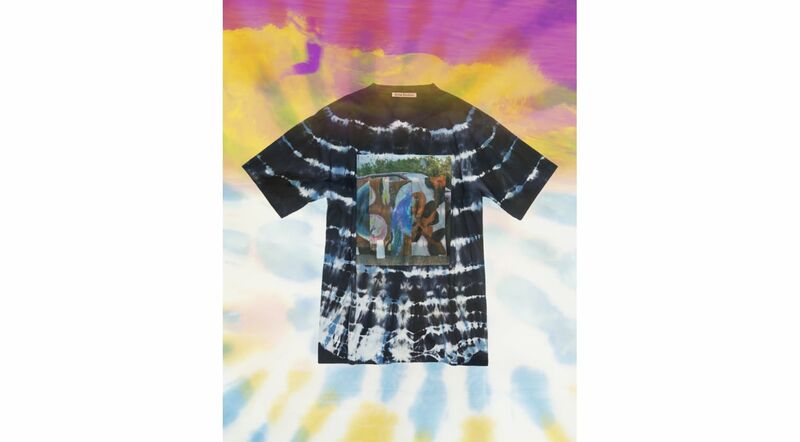 The special edition t-shirt capsule will be available in selected Acne Studios stores and on acnestudios.com from 18 April. Visit press.acnestudios.com for images and contact information. 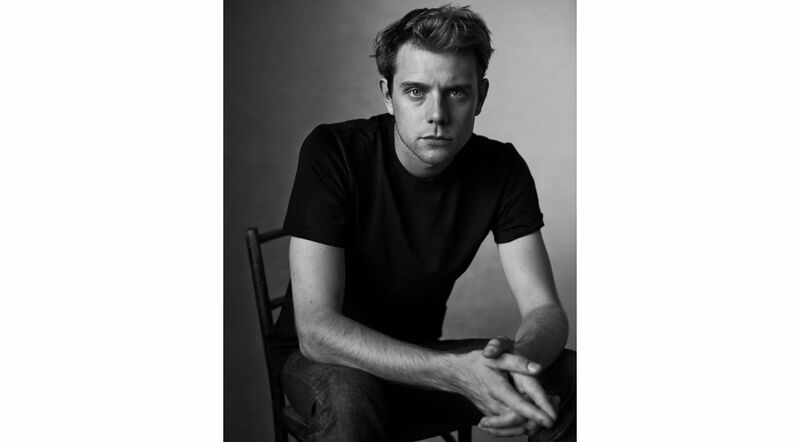 Jonathan Anderson, Designer and Creative Director of JW Anderson and LOEWE, is among four appointees named to the Trustees to the Board of the V&A by the Prime Minister of Britain. Anderson’s appointment is four years commencing on 4 February 2019. “I am inspired by art and artists every day, and thus I am honoured and humbled to join the board of such an impressive and important British institution,” said Jonathan Anderson regarding the appointment. The V&A is the world’s leading museum of art, design and performance with collections unrivalled in their scope and diversity, spanning 5000 years of human creativity. It was established in 1852 to make works of art available to all and to inspire British designers and manufacturers. Today, its purpose is to champion creative industry, inspire the next generation, and spark everyone’s imagination. 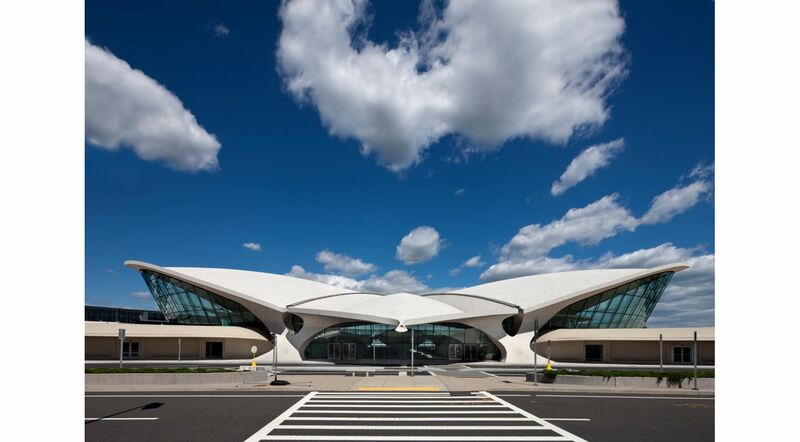 Louis Vuitton will present its Cruise 2020 collection at Eero Saarinen’s monumental TWA Flight Center at New York’s JFK Airport. 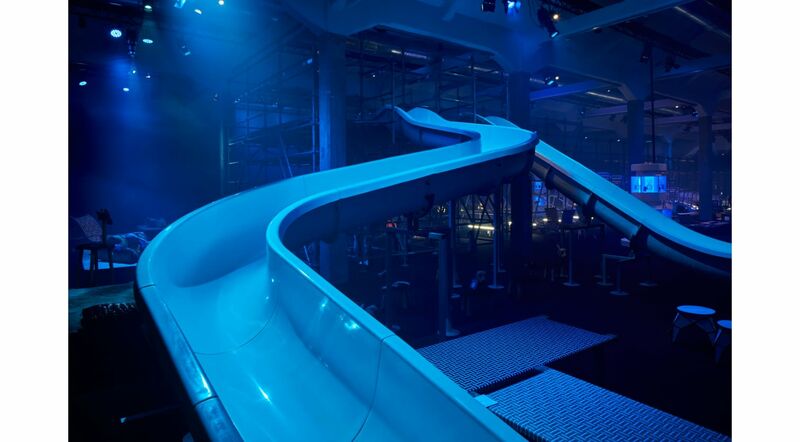 Louis Vuitton is delighted to announce that its next Cruise fashion show will take place at the TWA Flight Center, located at New York’s John F. Kennedy International Airport 8th May 2019. After Monaco, the Bob & Dolores Hope estate in Palm Springs, the Mac Niteroi in Brazil, Japan’s Miho Museum and the Fondation Maeght on the French Riviera, Nicolas Ghesquière will continue his architectural journey in the iconic 1962 TWA Flight Center, one of the world’s most imaginative airport terminals. a New York City landmark in 1994 and listed on the National Register of Historic Places and the New York Register of Historic Places in 2005, the TWA Flight Center went dark in 2001 and is currently under restoration as the heart of the 512-room TWA Hotel. 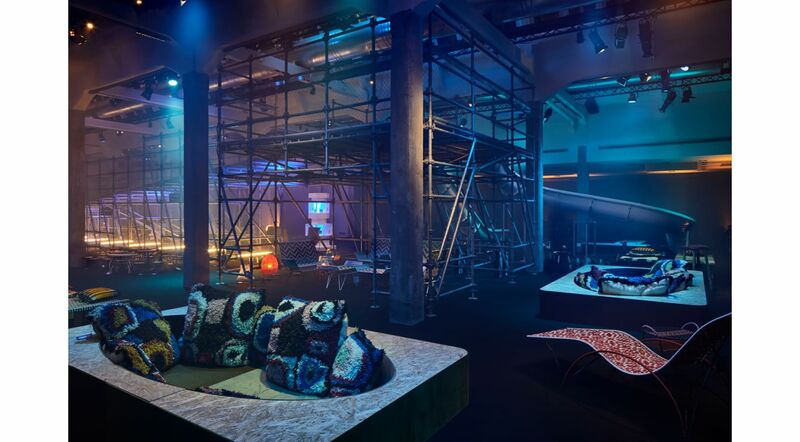 Louis Vuitton will be the first to stage an event in the restored New York landmark before it opens to the public on 15th May 2019. The TWA Flight Center, a sheer evocation of travel itself, is inherently linked to Louis Vuitton’s commitment to exclusive architectural discoveries, to its Art of Travel and represents an ideal close to Nicolas Ghesquière’s inspirations. Today, Chloé announces that the house will unveil its Resort 2020 collection via a runway presentation in Shanghai. The show is scheduled to take place on Wednesday 5th June, 2019 and it will mark the first time that the brand has unveiled a collection outside of France. 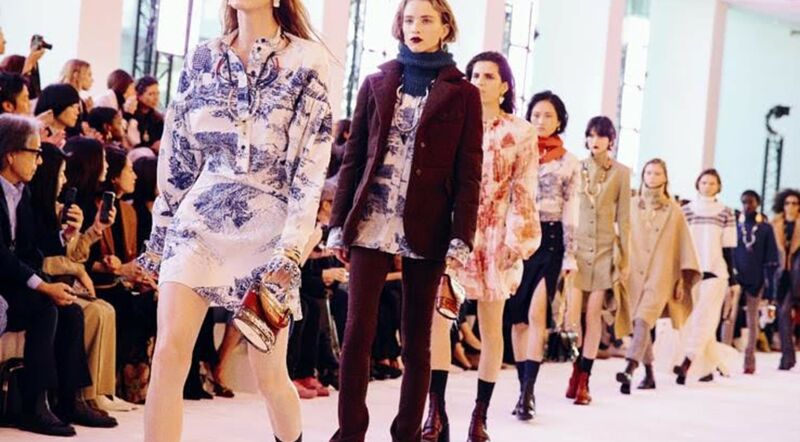 Additionally, it will mark the brand’s first major event in China since Natacha Ramsay-Levi was appointed at Chloé in 2017. Shanghai was selected as the location for this event, following an inspiration and research trip that Natacha embarked on, earlier in the year. 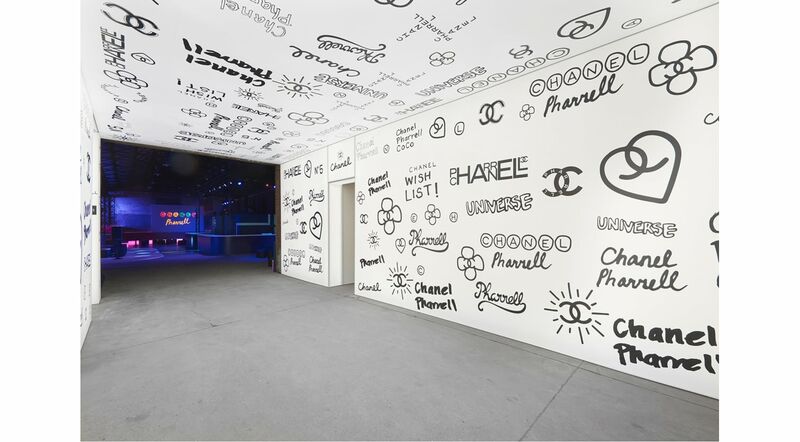 On March 28th 2019, CHANEL celebrated the opening of its first flagship boutique in Seoul. Since March 22nd the spacious seven-floor entirely new building offers the most luxurious retail experience to its clients on Apgujeong-ro. 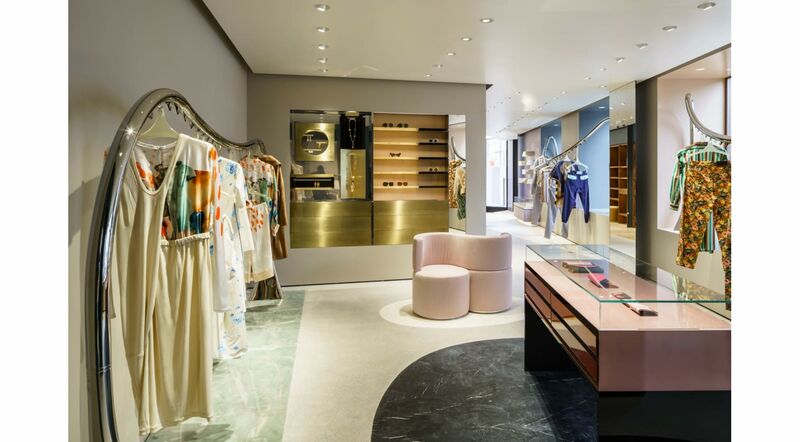 Cementing CHANEL's long-standing presence in South Korea, this is the legendary House's 10th boutique across the country. 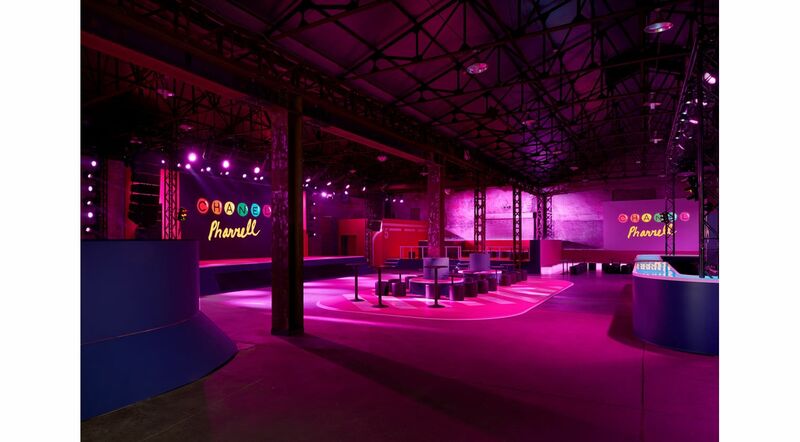 On this occasion, CHANEL unveiled the new Ready-to-Wear and accessories capsule collection CHANEL-Pharrell signed by Pharrell Williams for the Spring-Summer 2019 season. The artist combines his name with that of the House of CHANEL on block colour t-shirts, short and long robes, rhinestoned costume jewelry, leather belts, terry towelling bucket hats, hip packs in suede, loafers that also come as mules, as well as rectangular-shaped, shield and round glasses with a pop attitude. In the spirit of street art, Pharrell Williams appends his signature and his writing in the form of CC, N°5 and Coco embroideries and graffitis on a hooded sweatshirt, an oversize shopper and white sneakers with mismatched laces. The collection will be available in worldwide exclusivity on March 29th in the Seoul Flagship boutique, and then in certain CHANEL boutiques around the world from April 4th. A lively soirée feted the opening of the flagship and CHANEL-Pharrell capsule collection launch commencing with a cocktail in the boutique before guests including CHANEL ambassadors Pharrell Williams, Soo Joo, Jennie Kim, Go Eun Kim, Dong Wook Lee, Irene Kim, actresses Ryeo-won Jung, Yoona Lim, A Sung Ko, Claudia Kim, Yeonhee Lee, actors Seo-joon Park, Je-hoon Lee, singers Bobby, Zion.T and Jay Park, migrated to Daelim Warehouse where they enjoyed a performance by Pharrell Williams himself. Jennie Kim and DJs Soo Joo, Anna and Plastic Kid also performed.